Set on a tree-lined street in the eclectic neighborhood of West Seattle, Washington, Elan 41 Apartments offers a prime location for easy, city living. Our courtyard community boasts convenient access to West Seattle Bridge as well as the Commuter Rail, so you can travel to the city center with ease. But you don’t have to trek downtown to live, work, and play. There are a variety of top employers in the area, including Boeing, the VA Medical Center, and South Seattle College. Plus, our West Seattle, WA, apartments for rent are located near CenturyLink Field, perfect for football and soccer fans alike. 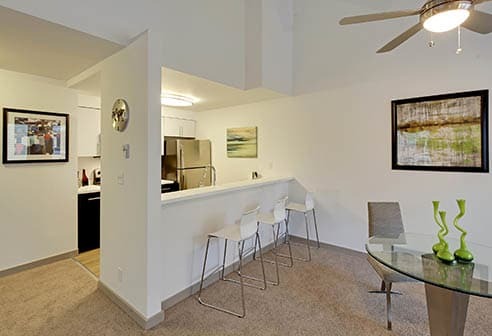 To inquire about our neighborhood or our West Seattle, Washington, apartments for rent near CenturyLink Field, give us a call at Elan 41 Apartments today. We want you to love your life at Elan 41 Apartments. That’s why our community is perfectly positioned near modern, local restaurants and exciting entertainment options. Located just around the corner, check out Bangbar Thai Restaurant & Lounge for a craft cocktail and classic Thai cuisine. On the weekends, enjoy a coffee and a breakfast pastry from Bakery Nouveau while you stroll around the neighborhood. If you’re always on the hunt for new music, stop by Easy Street Records & Café to browse their CDs and vinyl.